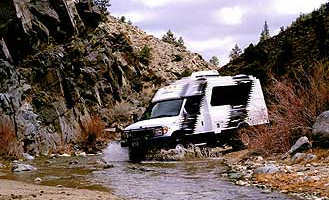 Off road recreational vehicles are only made by a few manufacturers. Several of those described below are quite interesting and would be neat to have, except for being a bit too cramped and/or somewhat out of range of our income. 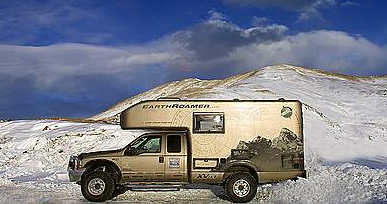 According to an article in the New York Times, Yakima, Washington's Chinook RVs recently suspended production of it's Baja model, produced with duel rear wheels and available with after-market 4 wheel drive. With a luxurious fully equipped interior—though cramped for our tastes—the Baja is listed at $120,000 - $150,000 on the manufacturer's website. 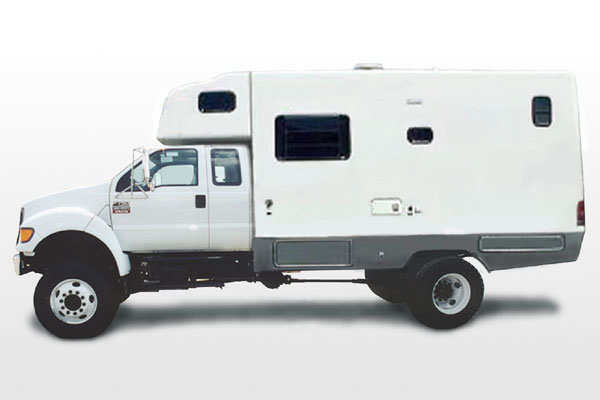 An RV that doesn't need electrical hookups, EarthRoamer is equipped with "super-sized" solar panel and "massive" marine batteries, supplemented by dual 130 amp alternators when the engine is running. Heating and cooking is accomplished with high-efficiency diesel appliances. A ceramic cook-top stove only uses .05 gallons of diesel an hour on the highest setting and only draws .15 volts at 12 volts DC. The diesel furnace easily maintains 70° inside with -10° outside, only using about 2 gallons of fuel a week. There is much more interesting and interesting information at the manufacturers website, including granite countertops, maple cabinetry and options for satellite TV and radio. 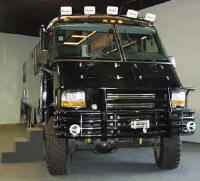 According to AutoWeek (August 15, 2005), a Ford F-450 or F-550-based EarthRoamer costs between $185,000 and $200,000. 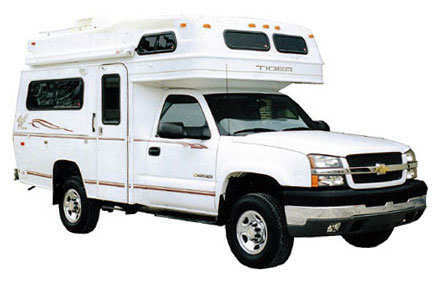 The Tiger CX, available only on the Chevrolet ¾ ton chassis, offers extensive RV amenities. With dimensions of 19' in length, a width of 87" and a total height of 107", it is available with a full range four wheel drive option. It is designed with a low center of gravity for stability and a 23° rear clearance angle and ground clearance to match. For more information, check out the manufacturer's website. (Production suspended, according to the New York Times.) 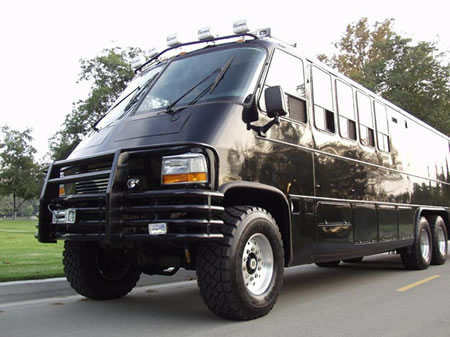 With it's outer skin constructed of aircraft aluminum, it is 32' in length, 96 inches wide, and 10 ½' tall. 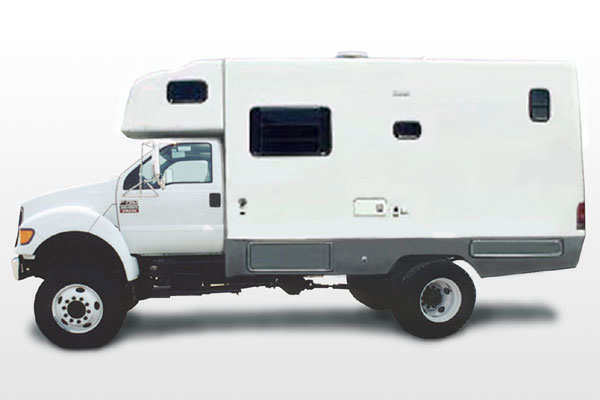 It boasts a full size bed in one floor plan. A 4kw "silent" generator is standard. Options included an upgrade to a 6kw generator, a 9,000 or 12,000 lb. 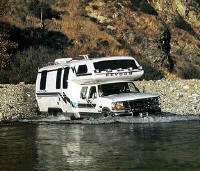 front bumper mounted winch, a water purifying system and much, much more. With pricing starting at $134,000, with options, the price could exceed $150,000. 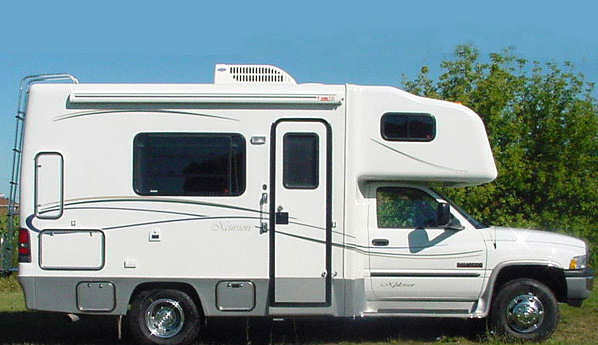 The pages for the 2004 model are still online at the manufacturer's website. 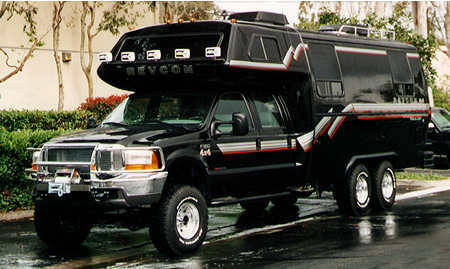 An upper end motor coach on steroids, all features for the Revcon Trailmaster are listed as standard, with a price on the manufacturer's website of $780,000. 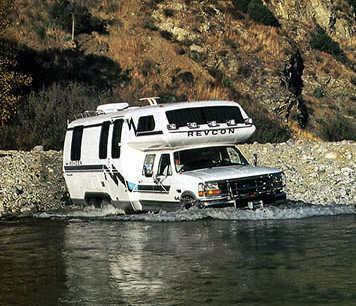 Features include a combination washer dryer, a Jacuzzi tub and shower combination, two Italian leather captain chairs in the "crew cab," remote control satellite dish, two 7 kw generators and a 12,000 lb winch.